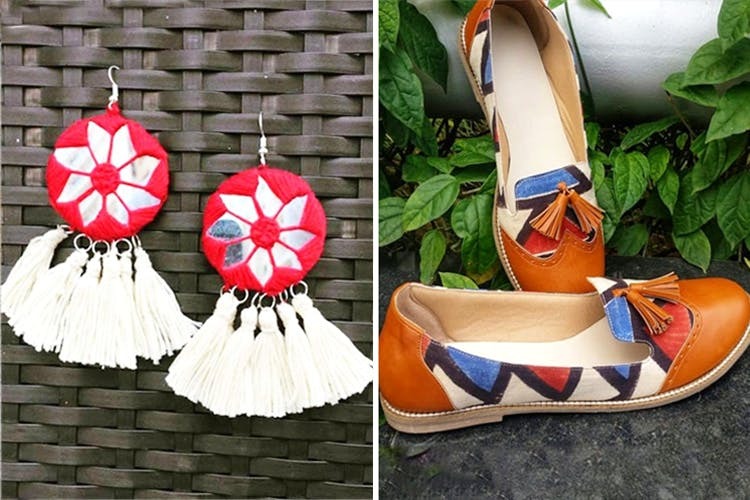 The Tassle Life is an accessories and footwear brand that's giving us Insta-inspo with their stylish earrings, colourful neckpieces, and designer footwear. What we like the most about their designs is that they're inherently traditional, but each piece has a contemporary twist to it—be it the embroidered earrings, the tribal neckpiece, or the colourful juttis, everything's got a design element that makes it stand out. They'll go great with both summer and winter looks. We like the Blossom earrings that are made using striped buttons and tassels, the Shellies earrings, which are inspired by Gujarati and Rajasthani culture, have different fabrics such as leheriya, ikat, baandhni and quirky prints, and the Merry-Go-Round neckpiece that's got intertwined, multicoloured wool with tassels and pearls. Their footwear section has juttis and sliders, with varied embroidery and designs which are comfy and go great with ethnic looks. With the festive and wedding season around the corner, these are straight up essentials—pair it with the right outfit, and you can pull them off at work or even a date. They don't have a website yet, so you'll have to scroll through their social media pages to find your favourites. We hope they get one soon.